A while back, Dave ordered a weather station. His research pointed to the Ambient Weather WS-2000 as the best bang for the buck as far as accuracy (after it's calibrated, which is a time consuming and exacting process where you compare readings to a known-good mercury thermometer, a process that I suspect most weather station owners don't bother with). Having the console readout and the Ambient "dashboard" is all very nice, but of course, being a data geek, I wanted a way to get the data myself, so I could plot it, save it or otherwise process it. And that's where Ambient falls short. The console, though it's already talking on wi-fi, gives you no way to get the data. They sell a separate unit called an "Observer" that provides a web page you can scrape, and we actually ordered one, but it turned out to be buggy and difficult to use, giving numbers that were substantially different from what the console showed, and randomly failing to answer, and we ended up returning the observer for a refund. The other way of getting the data is online. Ambient provides an API you can use for that purpose, if you email them for a key. It mostly works, but it sometimes lags considerably behind real time, and it seems crazy to have to beg for a key and then get data from a company website that originated in our own backyard. What I really wanted to do was read the signal from the weather station directly. 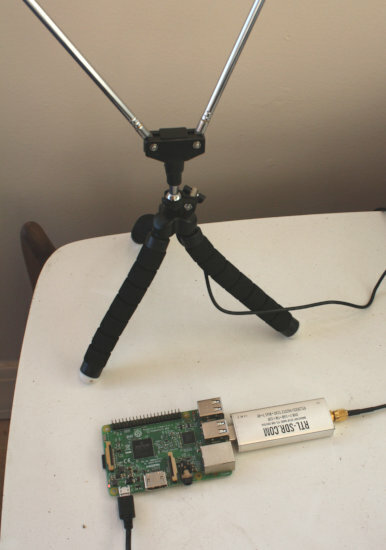 I'd planned for ages to look into how to do that, but I'm a complete newbie to software defined radio and wasn't sure where to start. Then one day I noticed an SDR discussion on the #raspberrypi IRC channel on Freenode where I often hang out. I jumped in, asked some questions, and got pointed in the right direction and referred to the friendly and helpful #rtlsdr Freenode channel. On the experts' advice, I ordered a RTL-SDR Blog R820T2 RTL2832U 1PPM TCXO SMA Software Defined Radio with 2x Telescopic Antennas on Amazon. This dongle apparently has better temperature compensation than cheaper alternatives, it came with a couple of different antenna options, and I was told it should work well with Linux using a program called rtl_433. rtl_433 already knows the protocol for the WS-2000, so I didn't even need to do any decoding or reverse engineering; it produces a running account of the periodic signals being broadcast from the station. rtl_433 also helpfully offers -F json and -F csv options, along with a few other formats. What a great program! JSON turned out to be the easiest for me to use; initially I thought CSV would be more compact, but rtl_433's CSV format includes fields for every possible quantity a weather station could ever broadcast. When you think about it, that makes sense: once you're outputting CSV you can't add a new field in mid-stream, so you'd better be ready for anything. JSON, on the other hand, lets you report just whatever the weather station reports, and it's easy to parse from nearly any programming language. Once I knew the dongle was working, I needed to verify what frequency the weather station was using for its broadcasts. What I really wanted was something that would scan frequencies around 915M and tell me what it found. Everyone kept pointing me to a program called Gqrx. But it turns out Gqrx on Linux requires PulseAudio and absolutely refuses to work or install without it, even if you have no interest in playing audio. I didn't want to break my system's sound (I've never managed to get sound working reliably under PulseAudio), and although it's supposedly possible to build Gqrx without Pulse, it's a difficult build: I saw plenty of horror stories, and it requires Boost, always a sign that a build will be problematic. I fiddled with it a little but decided it wasn't a good time investment. I eventually found a scanner that worked: RTLSDR-Scanner. 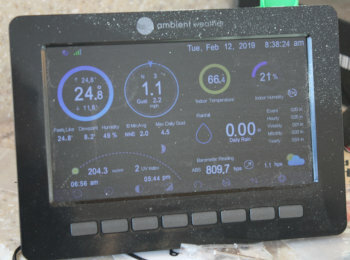 It let me set limiting frequencies and scan between them, and by setting it to accumulate, I was able to verify that indeed, the weather station (or something else!) was sending a signal on 915 MHz. I guess by then, the original problem had fixed itself, and after that, rtl_433 started showing me signals from the weather station. It's not super polished, but it's the only scanner I've found that works without requiring PulseAudio. This on a day when it hadn't rained in ages. What was up with that "rainfall_mm" : 90.678 ? I asked on the rtl_433 list and got a prompt and helpful answer: it's a cumulative number, since some unspecified time in the past (possibly the last time the battery was changed?) So as long as I make a note of the rainfall_mm number, any change in that number means new rainfall. This being a snowy winter, I haven't been able to test that yet: the WS-2000 doesn't measure snowfall unless some snow happens to melt in the rain cup. Some of the other numbers, like uv and uvi, are in mysterious unknown units and sometimes give results that make no sense (why doesn't uv go to zero at night? You're telling me that there's that much UV in starlight? ), but I already knew that was an issue with the Ambient. It's not rtl_433's fault. I notice that the numbers are often a bit different from what the Ambient API reports; apparently they do some massaging of the numbers, and the console has its own adjustment factors too. We'll have to do some more calibration with a mercury thermometer to see which set of numbers is right. Anyway, cool stuff! It took no time at all to write a simple client for my WatchWeather web app that runs rtl_433 and monitors the JSON output. I already had WatchWeather clients collecting reports from Raspberry Pi Zero Ws sitting at various places in the house with temperature/humidity sensors attached; and now my WatchWeather page can include the weather station itself. 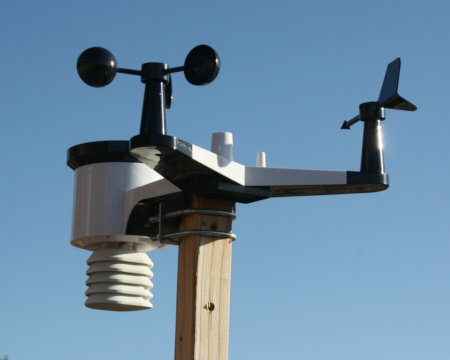 Meanwhile, we donated another weather station to the Los Alamos Nature Center, though it doesn't have the SDR dongle, just the normal Ambient console reporting to Wunderground. The steps for modifying the file are fairly easy, but they have to be done a lot. First there's the problem of Firefox updates: if a new omni.ja is part of the update, then your changes will be overwritten, so you'll have to make them again on the new omni.ja. But, worse, even aside from updates they don't stay changed. I've had Ctrl-W mysteriously revert back to its old wired-in behavior in the middle of a Firefox session. I'm still not clear how this happens: I speculate that something in Firefox's update mechanism may allow parts of omni.ja to be overridden, even though I was told by Mike Kaply, the onetime master of overlays, that they weren't recommended any more (at least by users, though that doesn't necessarily mean they're not used for updates). But in any case, you can be browsing merrily along and suddenly one of your changes doesn't work any more, even though the change is still right there in browser/omni.ja. And the only fix I've found so far is to download a new Firefox and re-apply the changes. Re-applying them to the current version doesn't work -- they're already there. And it doesn't help to keep the tarball you originally downloaded around so you can re-install that; firefox updates every week or two so that version is guaranteed to be out of date. All this means that it's crazy not to script the omni changes so you can apply them easily with a single command. So here's a shell script that takes the path to the current Firefox, unpacks browser/omni.ja, makes a couple of simple changes and re-packs it. I called it kitfox-patch since I used to call my personally modified Firefox build "Kitfox". Of course, if your changes are different from mine you'll want to edit the script to change the sed commands. I hope eventually to figure out how it is that omni.ja changes stop working, and whether it's an overlay or something else, and whether there's a way to re-apply fixes without having to download a whole new Firefox. If I figure it out I'll report back. My article on Fixing key bindings in Firefox Quantum by modifying the source tree got attention from several people who offered helpful suggestions via Twitter and email on how to accomplish the same thing using just files in omni.ja, so it could be done without rebuilding the Firefox source. That would be vastly better, especially for people who need to change something like key bindings or browser messages but don't have a souped-up development machine to build the whole browser. Brian Carpenter had several suggestions and eventually pointed me to an old post by Mike Kaply, Don’t Unpack and Repack omni.ja[r] that said there were better ways to override specific files. I was a little put off by all the warnings unzip gave, but kept going. Of course, you can just edit those two files rather than using sed; but the sed command was Paul's way of being very specific about the changes he was suggesting, which I appreciated. Also note the flags like safe-mode and no-remote, plus disabling plugins -- all good ideas when testing something new. And it worked! When I started up, I got the new message, "Search or just twiddle your thumbs", in the URL bar. I typed a few words in the google search field that came up, deleted them with Ctrl-W -- all was good! Thanks, Paul! And Brian, and everybody else who sent suggestions. Why are the sizes so different? So apparently Mozilla's omni.ja is using no compression at all. It may be that that makes it start up a little faster; but Quantum takes so long to start up that any slight difference in uncompressing omni.ja isn't noticable to me. I was able to run through this whole procedure on my poor slow netbook, the one where building Firefox took something like 15 hours ... and in a few minutes I had a working modified Firefox. And with the sed command, this is all scriptable, so it'll be easy to re-do whenever Firefox has a security update. Win! Update: I have a simple shell script to do this: Script to modify omni.ja for a custom Firefox.